North Korea is potentially days away from launching a controversial rocket mission that, the country says, will send a new Earth-observing satellite into orbit. Many nations, including the United States, have criticized the impending launch, which they see as a missile test in disguise. The North Korean long-range rocket, called Unha-3 (Galaxy-3), is slated to launch sometime between April 12 and April 16, to mark the 100th anniversary of the birth of Kim Il Sung, who helped establish North Korea in 1948. While North Korean officials maintain that the satellite launch is part of a peaceful space program, U.S. and South Korean officials have condemned the move, claiming it is a cover for testing military missiles. "We discussed regional security, and that obviously includes the issue of North Korea," Obama said in the March 25 news briefing in Seoul. "As President Lee mentioned, this would constitute a direct violation of Pyongyang's own commitments and its international obligations. Moreover, it would only deepen North Korea's isolation, damage further its relations with its neighbors, and seriously undermine the prospect of future negotiations." 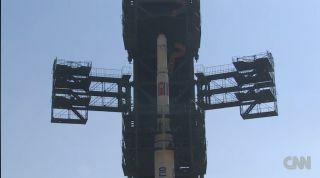 Since the launch could occur as early as Thursday (April 12), North Korea is expected to begin fueling the Unha-3 rocket soon, according to South Korea's Yonhap News Agency. "North Korea has only fueling remaining after completing the installation of three stages of boosters on a launch pad," a South Korean official told the Yonhap News Agency on condition of anonymity. "Fueling is expected to begin soon, considering it usually takes two to three days." South Korean officials have said they may shoot down parts of the Unha-3 rocket if they breach the state's borders. According to a translation of the North Korean newspaper Rodong Sinmun, a spokesman for the Committee for the Peaceful Reunification of Korea said that intercepting the satellite will be regarded as an act of war and could carry tremendous consequences. North Korea's new leader Kim Jong Un recently entered into an agreement with the U.S. to halt long-range launches in exchange for food to curb the country's widespread famine. Obama has said that if North Korea proceeds with the launch, it could jeopardize the food aid agreement.